Familarity breeds both contempt and kale salad. There’s a certain kind of restaurant to which I refer, somewhat derisively, as Brooklyn Restaurant Model #17. There are a lot of them, and they all seem to be following a very strict set of guidelines. The space will be furnished with salvaged wood, antique mirrors, and industrial light fixtures. They’ll have an extensive local beer list with at least one very dry cider. The (local! seasonal! farm-driven!) menu will feature, always, a fancy burger and…a kale salad. Truth be told, I happen to love all of those elements and dishes. If I could, my whole home and weekly dinner plan (which I would both totally have AND adhere to in this weird fantasy world) would look like Brooklyn Restaurant Model #17. But I live in a Victorian house that was last renovated in the 80s and doesn’t lend itself to industrial decor, and I believe, like Laurie Colwin, that burgers are strictly restaurant food. However, I can and do make a big kale salad once a week or so and, after some trial and error, have finally landed on my favorite formula and process. It started with this recipe, but I think it’s morphed enough that I can call it my own. There’s a fair amount of prep work, especially if one doesn’t have leftovers to mine, but it goes pretty quickly, especially when there’s a good audiobook on my phone and I’m kind of mood where mindless chopping is more of a meditation than a hassle. Even starting totally from scratch, I can get home at 6:30 and be eating this by 7:30 or so. It’s a matter of getting the stuff that takes longer going immediately, then doing the rest of the work while the things that need to cook do. Walk in the door, put a pot of water on the stove to boil. Turn the oven on to 450. Take off coat. Take two (thick-cut) or three (normal) slices of bacon out of the freezer. Set them aside to thaw. Peel a large sweet potato and chop into 1/2″ dice. When the water boils, salt it and add 1/2 c. or so of barley. Put a spoonful of coconut oil in a baking pan and stick it in the oven for a few minutes to melt. While it’s in there, slice a small onion (not essential, but there are enough sweet elements in the salad that I like to tone the sweet potato down a little bit). Put the sweet potato and onion slices into the baking pan, stir to coat with the oil, and stick the pan in the oven. Remember to stir once in a while. 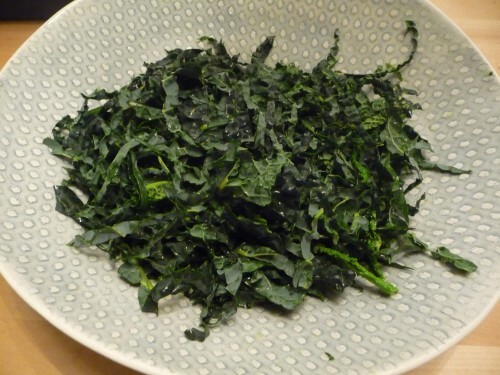 Wash a bunch of lacinato kale, derib, and cut into thin ribbons by stacking a few leaves, rolling them up, and slicing thinly. Put the raw kale in a bowl. 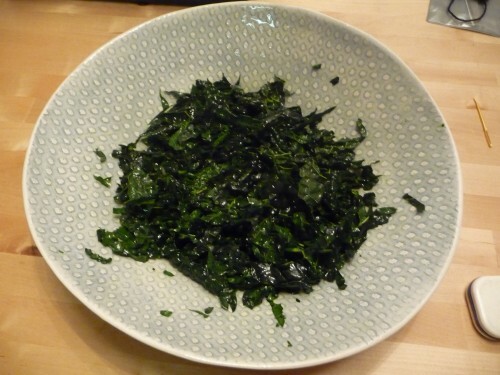 Sprinkle the kale with a bit of coarse salt and drizzle with olive oil, then work it with your hands for a few minutes. The action will soften the leaves and release a fair bit of the moisture inside them; the after photo below looks like an oily mess, but there was only a teaspoon or so of oil added. This step is optional, of course, but it helps break down the fibers and make the kale easier to chew. It still has a lot of texture, it’s just much less like lawn trimmings. Chop an apple into 1/2″ dice and add to the bowl. Toast 1/2 c. or so of nuts in a dry skillet; I’m partial to hazelnuts, but I’ve used walnuts, almonds, and pecans too and they’re all good. Chop them and add the the bowl. Cut the bacon into lardons and cook in the same skillet. At this point, the barley is probably done, so drain that and rinse with cool water; add to the bowl. The sweet potatoes are likely browned and toothsome–in they go! For the dressing, I pour off all but about two tablespoons of the bacon grease, then add some cider vinegar and maple syrup to what’s left in the pan. Stir to combine and pull up any bits at the bottom of the pan, then pour over the bowl and stir to combine. Garnish with the crispy bacon bits, some crumbled cheese (here it’s ricotta salata), and pomegranate seeds if you have some. This has rapidly become one of my favorite things to make and serve. It’s a riot of flavors and textures and nutrients. It’s endlessly and easily customizable for when one is or finds oneself feeding vegetarians, the allergy ridden, or the gluten free. It’s easy to do all or part of the prep ahead of time. I like it with red lentil soup (typically this one) when we have company for lunch, but it’s also great with a beer on the couch after the kind of day where making dinner seems like it’ll soothe the day’s wounds instead of poking at them. And it almost always yields enough for leftovers. I don’t care if kale salads are trendy, I still love them. That and shishito peppers. 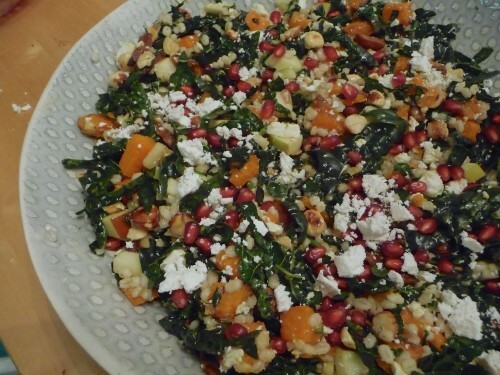 My kale salad is either healthy: lemon/pinenuts/raisins/cheese or unhealthy: lamb bacon/chickpeas/harissa. Both of those versions sound AMAZING. that dressing sounds insanely yummalicious. It sounds amazing. And it’s pretty, which is always nice. But please don’t serve it to the gluten free unless you leave out the barley!